McFadyen Group - McFadyen Group's excavator hire in Brisbane comes with professional service & support at affordable prices. We offer a range of excavators for hire. 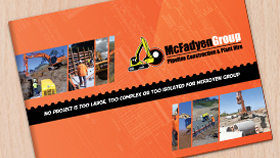 McFadyen (MFG) is an Australian privately owned company in the Pipeline Construction and Plant Hire industry. MFG have provided services in highway construction, railway line construction, and airport construction, along with much more. In particular, MFG is also known for providing high quality excavator Plant Hire services. Quality excavator hire in Brisbane can be difficult to find, particularly for major projects. At MFG, there are quality excavators in a range of sizes and with attachments to choose from. MFG’s Brisbane excavator range varies from the 5-tonne Airman, all the way to the larger 49-tonne Caterpillar. Along with the ability to hire large and mini excavators, you also have the option to choose between Wet or Dry hire excavators. Plant Hire can be Wet or Dry at any size or combination. All MFG Plant Hire comes with professional service and support at a high quality with very competitive rates. MFG offers excavators for hire in Brisbane at competitive prices to help reduce operational costs and, therefore, improve profitability. Through MFG’s expert Operators and support services, all Clients are better equipped to meet project deadlines. For any excavation project, MFG is the solution. MFG have a fleet of the most reputable brand names such as Caterpillar, JCB, Airman and Doosan. All of MFG’s Plant and Equipment is well maintained and stored to ensure the best quality services at all times. Additionally, with MFG’s dynamic team of highly experienced and skilled staff, provide an outstanding service. There is no project too big, too difficult or too isolated for MFG who provide the best excavating Plant and Equipment services in the market. If you would like to more information about MFG’s Plant Hire, please contact MFG.